Everyone loves a good deal. Kayaking trips can get pricey if you’re looking for something all-inclusive, but there are always some paddle holiday deals to be had too. With summer in full swing, there’s still time to book a trip, whether you want to stick close to home or go farther afield. Take a look at these kayaking deals for the next few weeks, grouped by destination and with plenty of bonus activities. Note: all deals correct at time of posting. You’ll have to be quick to grab this offer, which is super last minute for dates up to July 20th, 2018. Book for a family of 4 or more to get a €200 discount on this 8-day tour in Palamos. It includes sea kayaking and paddleboarding, as well as lots of cycling, and some snorkelling and walking. Nature Travels is offering 5% off all their summer tours for this year, thanks to the stronger pound. They have a selection of kayaking and canoeing trips in Finland, Norway and Sweden, as well as timber rafting in Sweden and packrafting in Finland. This fun tour is definitely for foodies, and it’s a pretty comprehensive 5-day package. 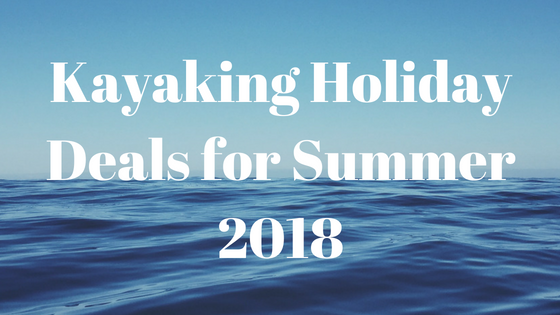 It includes a kayaking guide and culinary guide, all gear for kayaking, camping and cooking, return transport from Norrköping to Saint Anna (you can get to Norrköping by bus or train from Stockholm Skavsta Airport), beverages,and a guide book. The discount is for September, so ideal if you want to escape the summer crowds. Get a discount for a September trip with this tailor-made tour. You can choose from several kayak excursions, as well as a variety of other easy-going activities. Get 15% off this two-week Thailand tour on trips for the rest of the year, up to December 15th. Even with the discount, it still runs at over £1,000, but there’s plenty included. The kayak portion of the tour is towards the end, with three excursions in the Andaman Sea. Save 10% on another Southeast Asia adventure with this Cambodia trip. Start in Phnom Penh, then cycle, hike and get the occasional boat or car. You’ll get the chance to kayak on the Mekong on day 5 of 9, and there’s a visit to Angkor Wat and other historical sites. Another hike, bike and kayak tour in Asia – well, they do go well together. Spend 9 days in Borneo, and on the 8th day, go on a kayaking adventure. After taking a boat to Manukan Island, you’ll spend some time island hopping in your kayak and get some chances to snorkel too. Spend as little as £611 on this 9-day tour in Costa Rica – although it’s a bit more if you want to go during the summer. The tour includes a kayak and SUP session on Lake Arenal, as well as a kayak excursion on the Cuarto River, plus another in Tortuguero. Other activities include hiking and there’s plenty of free time to enjoy yourself. For another Costa Rica option from G Adventures, this 16-day tour is now under £900 (starting price). You’ll visit the same places as on the 9-day tour but also visit Quepos and Monteverde during the first few days. You can kayak in Manuel Antonio National Park, raft in La Fortuna and kayak again in Tortuguero – among lots of other diverse activities. This is just a selection of the ways you could save this summer. From family holidays to group tours, you can enjoy your kayaking holiday for less.